Use 80% discount code to bring it down in price. 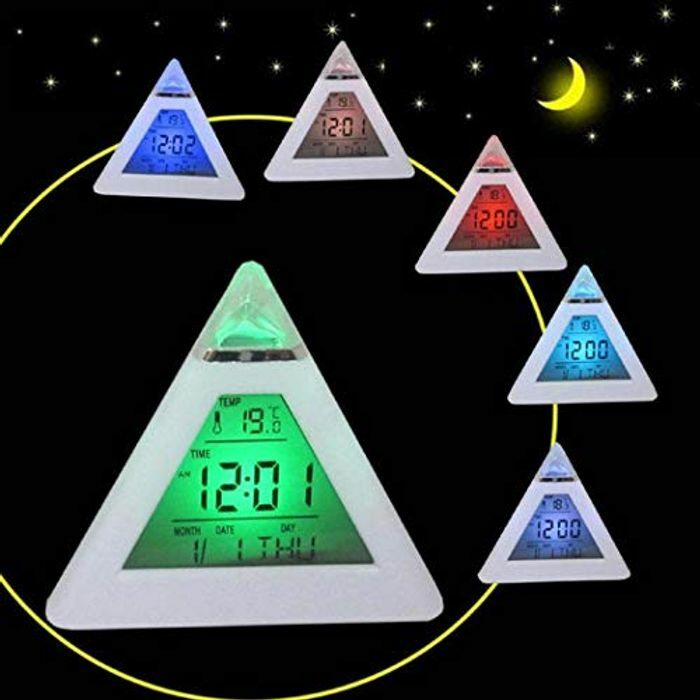 Color changing geometric digital display clock. Temperature display, visual and auditory double wake up function. 【Smart Digital Clock】 Large LCD screen is easy for reading time, perfect for children, adult and the aged people. It can automatically sense the environment temperature and is also able to switch between Celsius and Fahrenheit. When you set the date, the day of week will match accordingly. 【Multi Function】Displays time, week, month, year& temperature, supports the 12- and 24-hour time formats. 【Multi Color & Alarm Sounds】This modern design alarm clock can act as an atmosphere lamp that includes green, red, blue, purple, orange, yellow and indigo for your preferences. 【Easy To Use and Convenient】With intuitive and easy-to-use touch keys, it is very easy and comfortable to set time, alarm, light, temperature and operate all kinds of functions. Compact size and light weight makes it convenient to be placed in the car, office and home. 【Amazing Gift】A wonderful birthday or festival gift, and also an expression of concern and care for the people you love.